The Maldives is considered one of the most sought-after luxury vacation destinations in the world. Made up of more than 1,000 coral islands, the Maldives is a tropical archipelago located in the Indian Ocean. With the incredible white sand beaches, extensive coral reefs, and crystal-clear blue water, it’s the perfect island excursion for a relaxing vacation or special honeymoon destination. And the Maldives can be a fun adventure too! With an endless amount of watersports to choose from, no visit is complete without experiencing some of the best snorkeling and diving spots in the world (think manta rays and whale sharks). While the Maldives does have some budget-friendly accommodations, most of those are in or very close to the capital city of Malé, and might not meet your high expectations for the Maldives. This guide will help explain the best award programs for you to upgrade your entire dream vacation to the Maldives. From flights to hotels, we’ve got you covered to help you experience the Maldives in style without the high price tag. Getting to the Maldives sounds like it could be a difficult task — a group of islands thousands of miles away in the middle of the Indian Ocean doesn’t seem like it would be super easy to get to! But since this is such a sought-after destination, many airlines do offer flights to the Maldives. While no U.S. airlines offer flights directly to the Maldives, there are plenty of other options utilizing your flexible reward points and partner award charts. Award availability may be a challenge when looking for flights to the Maldives, but we’ve got a great guide to help make searching for award space easier. Hot Tip: If you’re running into a lot of dead ends, consider flying into Colombo, Sri Lanka. It’s just about an hour away by air to the Maldives and often has much more award availability. The American Airlines AAdvantage program can help you get to the Maldives even though American Airlines doesn’t operate flights there. American Airlines offers some great options to get to the Maldives by booking on their partner airlines. Here are some of our favorite partners to redeem AAdvantage miles to the Maldives. Etihad offers flights from the U.S. to the Maldives via Abu Dhabi in the United Arab Emirates. American Airlines does not show Etihad award availability or allow you to book these award flights online. You can search for award availability directly on Etihad and look for “Etihad Guest” seats, since those are what American Airlines usually has access to. 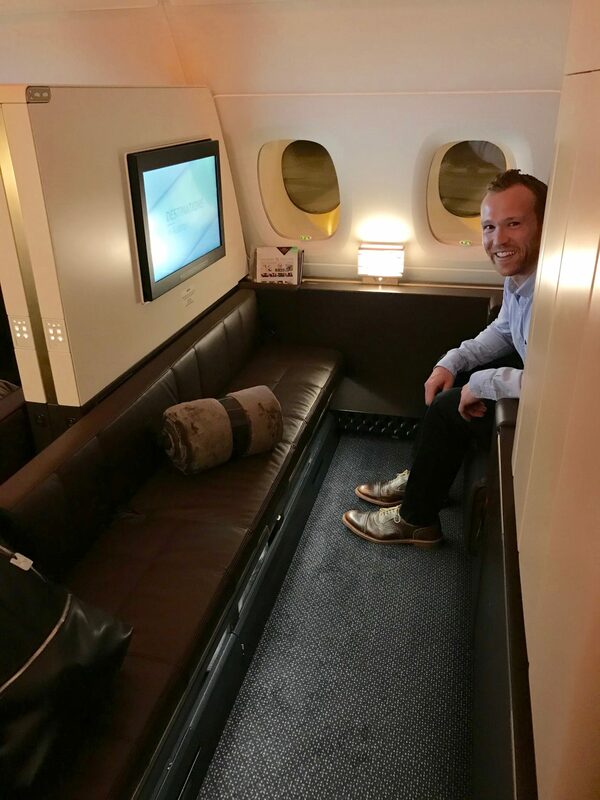 Etihad offers an incredible first and business class product on their long-haul flights from the U.S., including their famous Etihad First Class Apartment on their A380 aircraft (which flies from New York’s JFK airport). Award availability is usually pretty decent. Be sure to search segment by segment to increase your odds of finding the “guest” award seats. Hot Tip: If you are looking specifically for business or first class award seats on Etihad, the U.S. reservation agents are known to have difficulty in seeing that award space. Try calling other American Airlines reservation centers like Australia or Singapore, who can usually see Etihad’s availability. Want to know other ways to book Etihad airways to the Maldives in style? Check out our in-depth guides to the best ways to book Etihad business class flights and Etihad first class flights in a step-by-step guide. Cathay Pacific offers flights to the Maldives via Hong Kong, where it operates direct flights 4 times a week. American Airlines also does not allow you to book or see award availability on Cathay Pacific flights on their website. You can search award availability on British Airways or Qantas, and once you find your preferred seats on Cathay Pacific call AAdvantage to book. Cathay Pacific offers an incredible business and first class product on all flights from the United States, but only offers business class flights on the 6-hour flight to the Maldives from Hong Kong. Cathay Pacific flies to Hong Kong from the following cities in the U.S. and operates the Hong Kong – Malé Wednesdays, Thursdays, Saturdays, and Sundays. There are a few more ways to get access to Cathay Pacific award seats using other airlines’ programs. Alaska Airlines actually beats American Airlines in rates, but they don’t seem to have as much access to award seats. Hot Tip: You do have other options to fly up front with Cathay Pacific to the Maldives. Check out our step-by-step guide for booking business class flights and first class flights on Cathay Pacific. Qatar offers flights to the Maldives via Doha, and operates flights from 10 U.S. cities while providing daily flights from Doha – Malé. Award bookings and availability for Qatar Airways flights are not available when searching on American Airlines. Instead, it’s best to check the award search engines on British Airways or Qantas to find availability before calling AAdvantage. Qatar Airways does not offer any of its first-class products from its U.S. destinations. Don’t let that deter you if you’re going for ultimate luxury, since their business class product can easily be compared to some other first class products out there! We would highly recommend trying to get availability on their new business class product QSuites, which is among the best business class products on the market. These QSuites are currently installed on some of their A350 and Boeing 777 aircraft that operate out of New York (JFK), Chicago (ORD), Houston (IAH) and Washington, D.C. (IAD). 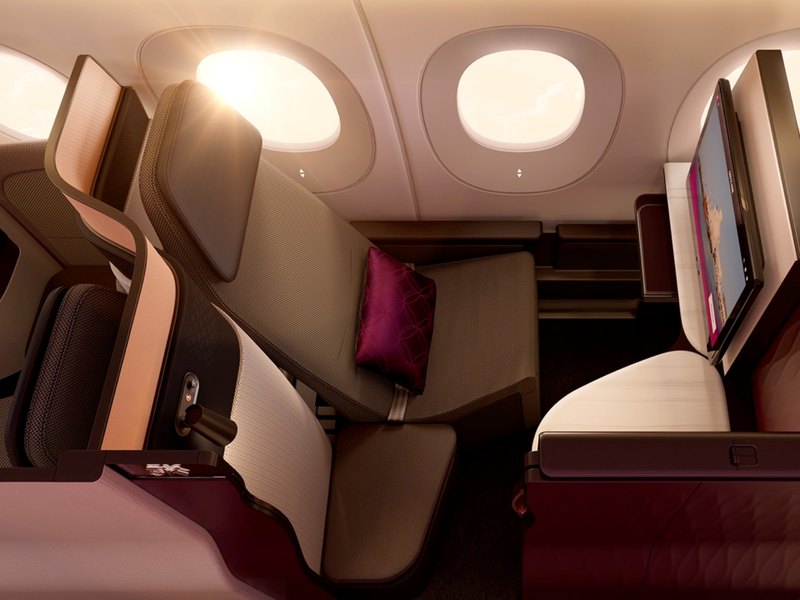 Qatar Airways’ new QSuites business class is expanding in the U.S. and looks almost like a first class seat! Image courtesy of Business Insider. Qatar Airways flies to Doha from the following U.S. cities. For even more information, check out our piece: The Best Ways to Book Qatar Airways “QSuites” with Points and Miles. Bottom Line: American Airlines AAdvantage provides some of the best award rates (70,000 one-way in business class) and best premium cabins in first and business class (Etihad Apartments) when using their award miles to book flights to the Maldives on partner airlines. 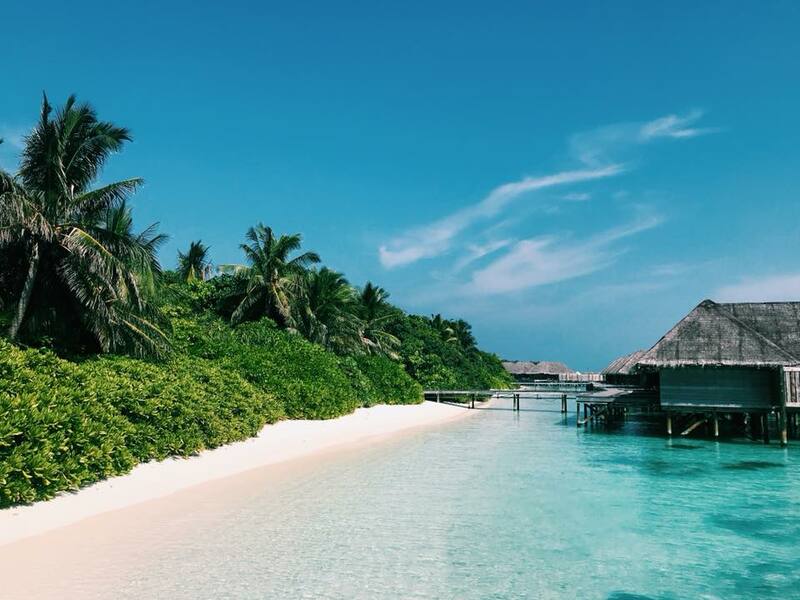 Check out our favorite American Airlines AAdvantage credit cards to help get you to the Maldives! There are so many ways to earn American Airlines AAdvatange miles. Some of our favorite methods to rack up lots of AAdantage miles are the many credit cards that earn with (or can transfer to) American Airlines. Both Citibank and Barclays offer quite a few different flavors of American Airlines AAdvantage credit cards for both personal and business use. Each comes with unique benefits that will help you earn lots of AAdvantage miles and other great perks when you fly American Airlines. Now with the combined Marriott Bonvoy program, there are even more ways to earn lots of Marriott Bonvoy points. Luckily, the new Marriott Bonvoy has enhanced their airline transfer program and added even more partner airlines you can transfer your Marriott points to. Marriott points transfer to most of their airline partners at a rate of 3 Marriott points to 1 airline mile. Plus, you can get even more value by transferring more Marriott points to your favorite airline partner. For every 60,000 Marriott points you transfer to most of their partner airlines, you will receive 5,000 bonus airline points instantly. That’s a great incentive to earn extra Marriott points when you want to transfer to airline partners. We’ve even created a great guide to show you all the best ways to use your Marriott points for flights, so you can get the most value out of your points! Alaska Airlines Mileage Plan is a unique award program since it doesn’t belong to any airline alliance. Instead, Alaska Airlines has direct partnerships with a number of global airlines to expand their reach. Each partner airline has a special award chart with Alaska Airlines, and the Maldives falls into the India and South Asia region category for their awards. Here are the one-way rates for award travel on their partners that fly to the Maldives — and don’t forget to check out the best ways to earn lots of Alaska Airlines Mileage Plan miles. We’ve already discussed Cathay Pacific with American Airlines miles. Even though Alaska Airlines has better rates, it seems they have even more limited award access compared to American Airlines AAdvantage. We will go more into detail with Korean Air using their own program, since those rates are better. Here, we’re going to focus primarily on Emirates award flights using Alaska Airlines miles. Emirates offers multiple flights via Dubai on its exclusive A380 and Boeing 777 fleet, with both first class and business class options all the way to Malé. Making an award booking on Emirates using Alaska Airlines miles is easy. Both award availability and booking can quickly be done online using Alaska Airlines award search. Want to add a couple of days in Dubai on your way to the Maldives? Alaska Airlines awards are perfect since they allow a free stopover, even on one-way flights! 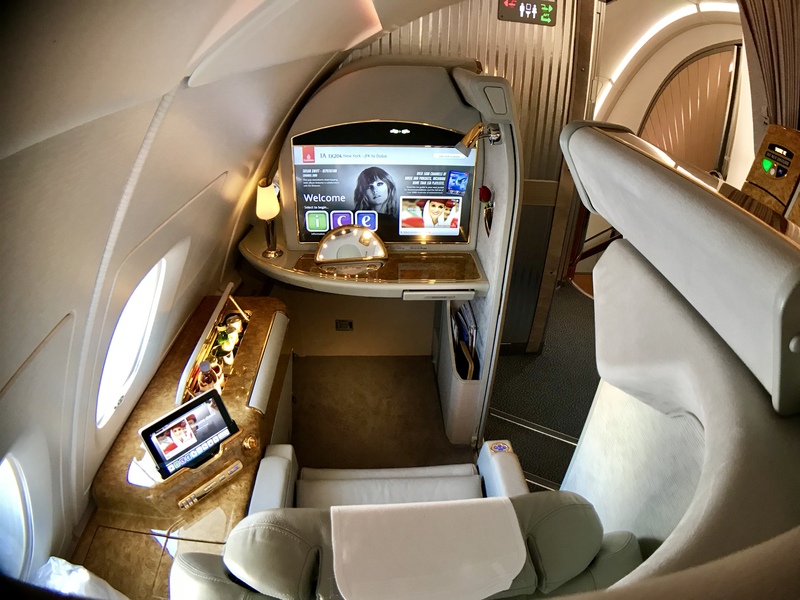 Emirates has an incredible first and business class product on its fleet — including the showers on their A380 — and award availability is usually easy to find using Alaska Airlines miles. You can get an in-depth look at flying first class on the Emirates A380 with our detailed review. Emirates also offers the most flights to the Maldives via Dubai, with a number of nonstop options and even more with short stops in Colombo, Sri Lanka. Want more options to get to the Maldives with Emirates? We have a step-by-step guide with the best ways to book business class flights and first class flights on Emirates. Bottom Line: Alaska Airlines Mileage Plus offers incredible rates to the Maldives, but they’re different for each partner. The best part about booking Alaska Airline award flights is when you have the opportunity to utilize their free stopover in the airlines’ “hub” city. Alaska Airlines does have co-branded credit cards with Bank of America that can help you earn some extra Mileage Plan miles. Alaska Airlines also is a partner airline for Marriott Bonvoy, giving you even more flexibility when looking to book Alaska Airline partner awards. We’ve covered some of the great benefits to transferring Marriott Bonvoy with partner airlines above, but you can see our guide on how to earn lots of Marriott Bonvoy points if you need more inspiration. Korean Air offers flights to the Maldives via Seoul, but it’s important to note that the flight from Seoul to Malé makes a quick stop in Colombo, Sri Lanka. Your best use of Korean Air SkyPass miles will be directly on Korean Air award flights. With the loss of Korean Air as a transfer partner for Chase Ultimate Rewards, you might think it’s difficult to get more Korean Air SkyPass miles — check out our favorite ways to earn lots of Korean Air SkyPass miles. Hot Tip: Check out our in-depth guide to booking first class on Korean Air since you can only experience Korean Air’s first class is by using their own SkyPass miles. Partner airlines do not have access to Korean Air’s exclusive first class seats. 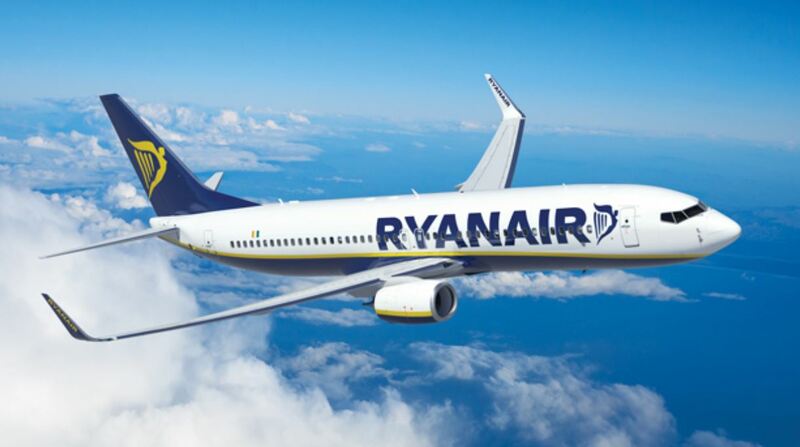 They offer an incredible first and business class product on flights to the U.S., which provides easy connections to the Maldives. The flight from Seoul to the Maldives also offers first class, but it’s basically the same seats as business class with an enhanced menu. It’s easy to search and book award flights using Korean Air SkyPass miles directly on their website. Just watch out for those taxes and fees, since they’re on the higher side compared to other programs. The good news is that award availability is usually pretty easy to find on Korean Air, and most of it will fall in the off-peak rates. Enjoy the caviar in your private suite on Korean Air first class. Image courtesy of Korean Air. Even though Korean Air makes their first class redemptions exclusive to their own SkyPass mileage program, there are other ways to book business class. 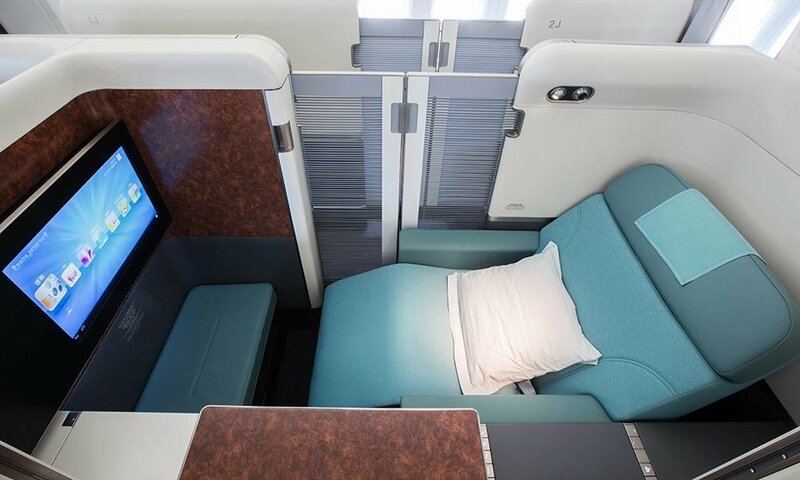 Take a look at the best ways to book Korean Air business class flights for other redemption options with other travel programs. Korean Air does have co-branded credit cards with US Bank. They also used to be one of our favorite transfer partners with Chase Ultimate Rewards, but unfortunately that partnership has ended. 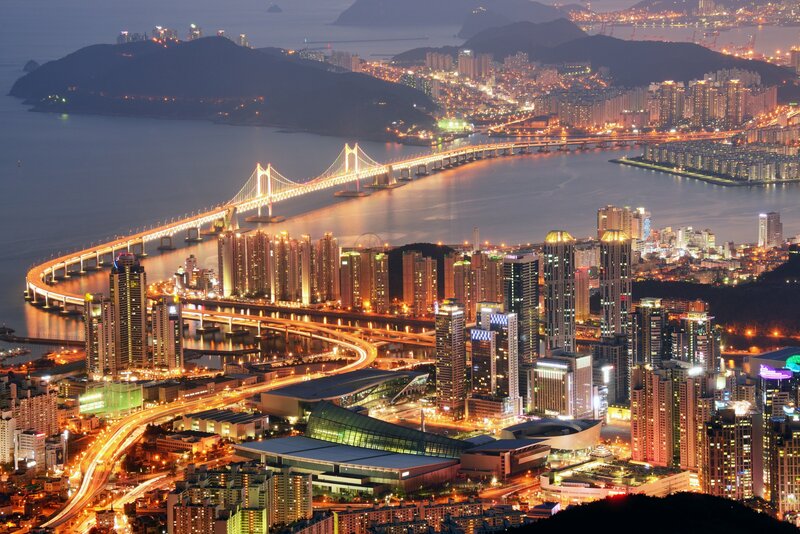 Hot Tip: Now, the best way to earn lots of Korean Air SkyPass miles is by transferring from Marriott Bonvoy. Here is our guide on how to earn lots of Marriott Bovnoy points so you can transfer them to Korean Air. United Airlines is a member of the Star Alliance, which allows quite a few different options when looking for award flights to the Maldives using the United Airlines MileagePlus program. Star Alliance carriers that offer regular service to the Maldives are Air India, Singapore Airlines, and Turkish Airlines. Other carriers sometimes operate seasonal service to the Maldives. When using MileagePlus, you could easily be flying with multiple carriers on a wide range of routes throughout the United States and beyond. The best part of United Airlines MileagePlus is that there are so many ways to earn lots of United Airlines MileagePlus miles! Hot Tip: Don’t forget to check out our in-depth review of United Airlines in its own dedicated piece! We’ve covered many ways of earning United Airlines MileagePlus miles, but if you’re in a rush for a one-way business class ticket to the Maldives, check out our guide on how to earn 100K+ United MileagePlus miles in 90 days! Chase Bank does have United Airlines co-branded credit cards, but our favorite way to earn MileagePlus miles is by transferring from Chase Ultimate Rewards — they have lots of great airline transfer partners that transfer 1:1. Marriott Bonvoy is another flexible option when looking to transfer points into United Airlines MileagePlus. The Maldives is a very popular bucket-list destination, but you have to book right to make it live up to the hype. Staying at the right hotel in the Maldives will definitely help this dream destination live up to your expectations. Luckily, there are plenty of options to find your perfect stay in the Maldives using points. Here, we’ll cover the top hotels in the Maldives to stay at using points. It’s important to consider the additional costs of staying at a popular but remote tourist destination. For example, traveling from the international airport in Malé to some of these resorts can cost $500+ per person to transfer by seaplane or speedboat! The Hilton Honors loyalty program is a great way to have a luxurious stay in the Maldives. It can be incredibly easy to earn lots of Hilton Honors points and make sure you have an extended stay in paradise. There is currently only 1 Hilton resort in the Maldives, the Conrad Maldives Rangali Island — but there are big plans to open 2 additional properties in early 2019! 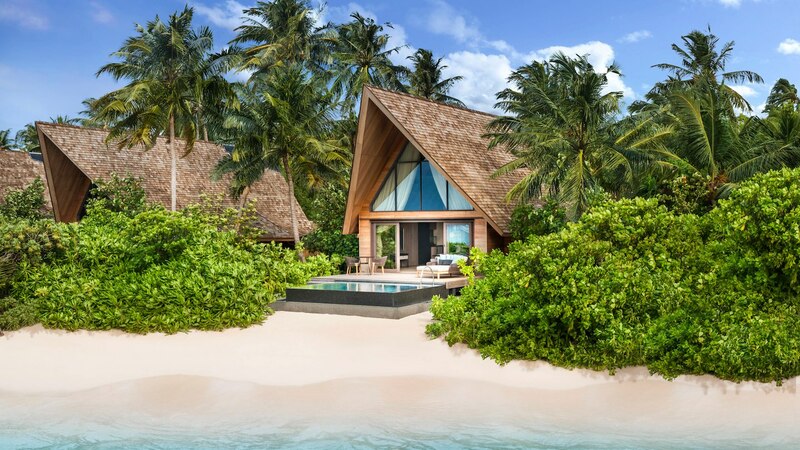 Hilton will soon have 3 options to choose from with the opening of the Waldorf Astoria Maldives Ithaafushi and the SAii Lagoon Maldives, Curio Collection by Hilton. Redeem Hilton Honors points for an overwater bungalow at the Conrad Maldives! Photo courtesy of Conrad Maldives Facebook. The Conrad Maldives Rangali Island is one of the best options to book using points in the Maldives, because it’s the only one that offers an overwater bungalow for the standard award price. That’s right: you can stay in an overwater bungalow in the Maldives on points! The Conrad Maldives is one of Hilton’s highest-tiered properties, costing 95,000 points per night for the standard award rate. But you don’t have to stay in an overwater bungalow for 95,000 points per night if you don’t want to — they offer some fabulous beach bungalows in the same award category. Having elite status with Hilton Honors will give you even more value for your points for longer stays. Starting at Silver status, Hilton Honors members get the 5th night free on a standard room award booking. That means you can stay in an overwater bungalow for 5 nights for just 380,000 points. That might sound like a lot of points, but there are plenty of American Express Hilton Honors credit cards to consider signing up for that can help you get there and even enhance your stay! Some of these Hilton Honors credit cards give you Gold or Diamond status, which will provide tremendous value when staying at this resort. For example, Gold status gives you free breakfast during your entire stay, which includes 2 different restaurants (one on each island) at this resort. The Conrad Maldives also goes above and beyond to provide a complimentary afternoon tea and happy hour for elite guests. You can get afternoon tea each day from 4pm-5pm with small sweets and light snacks. Immediately afterward, Gold members also are invited to a free happy hour with beer, wine, and mixed drinks at the Rangali bar from 5pm-6pm! Bottom Line: For an average of just 76,000 Hilton Honors points per night, you can stay in an incredible overwater bungalow using the 5th night free benefit and get free breakfast, tea, and happy hour with Hilton Honors Gold status — which is instantly earned just by having an American Express Hilton Honors Ascend Credit Card. 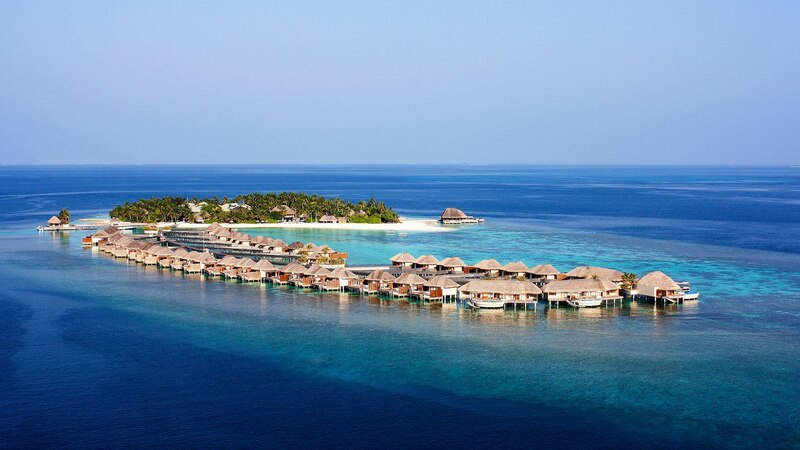 American Express has quite a few co-branded Hilton Honors credit cards that can easily get you enough Hilton Honors points for your stay in the Maldives. Another huge perk with some of these credit cards is that they can instantly get you elite status with Hilton Honors. As mentioned above, that benefit alone can save you hundreds of dollars with free breakfast and other perks during your stay at Hilton properties in the Maldives. Hilton Honors is also a transfer partner with American Express Membership Rewards points — they often have a transfer bonus, but the standard transfer rate is 1:1.2. Don’t forget to bring your Hilton credit card with you to the Maldives and use it for any extra charges during your stay — you could be earning up to 14 Hilton Honors points per dollar on eligible purchases at Hilton properties. Business owner? There are a number of Amex business credit cards that earn points that can be transferred to Hilton. Welcome Offer: Earn 125,000 Hilton Honors Bonus Points after you spend $3,000 in purchases on your Card in the first 3 months of Card Membership. 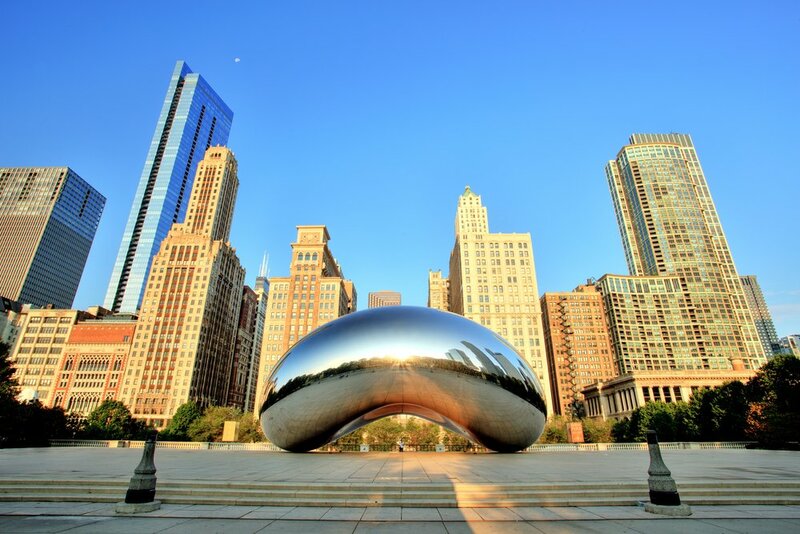 6x on business travel including flights, car rentals, US restaurants, US gas stations, wireless and shipping. The World of Hyatt loyalty program is another fantastic option to consider for staying at an incredible remote resort in the Maldives. There are plenty of opportunities to earn lots of World of Hyatt points to help you get there. You will have only 1 Hyatt property to choose from, but the Park Hyatt Maldives Hadahaa is definitely worth a visit. Image courtesy of Hyatt Maldives. The Park Hyatt Maldives Hadahaa is an incredible resort with a 360° house reef steps away from each villa. The standard award room is a Park Villa, and direct beach access makes it easy for you to snorkel just by walking out the door. Your standard award room rate will be 25,000 World of Hyatt points per night. While you can’t get an overwater bungalow just on points, hotels will often offer you paid upgrades, which could be worth it in this case. Those rates can depend on status, but mainly depend on availability. To get any exclusive benefits from elite status, you’ll have to go big — only Globalist elite members receive extra benefits. If you are a World of Hyatt Globalist elite member, you’ll get free breakfast for up to 2 guests plus complimentary cocktails and canapes from 5pm-7pm. There’s also a chance you could get a complimentary Pool Villa upgrade. The hotel also provides snorkel gear for all guests that you can borrow from their dive shop for your entire stay, and free yoga classes and kayaking to keep you active! You can also stay active by participating in some of their paid activities to really enhance your experience in the Maldives. This could include a private island picnic, visiting a local island, or snorkeling with whale sharks and manta rays! Chase offers a co-branded Hyatt rewards credit card, but another way to rack up even more World of Hyatt points is by transferring from Chase Ultimate Rewards. World of Hyatt is a transfer partner with Chase Ultimate Rewards at a rate of 1:1. Hot Tip: Check out our guide on the best ways to redeem your World of Hyatt points, which includes the easiest way to earn points by transferring from Chase Ultimate Rewards. You have lots of options to use the Marriott Bonvoy loyalty program for your stay in the Maldives. Bringing together 2 major hotel brands also offers many great opportunities to earn lots of Marriott Bonvoy points. Marriott currently operates 3 resort properties in the Maldives and is expecting to open the Westin Maldives Miriandhoo Resort in October 2018 and the JW Marriott Maldives Resort & Spa in January 2019. Don’t forget that all Marriott Bonvoy members get a 5th night free on award bookings, which can add significant value to your reward stay in the Maldives. The St. Regis Maldives Vommuli Resort can go for thousands of dollars a night. Luckily, with the Marriott merger, this property is now much easier to get on points. That’s if you can find availability, which is rare. Once the merger gets more settled in 2019, the St. Regis Maldives award rates will be 70,000 points for off-peak nights, 85,000 standard, and 100,000 peak. Hot Tip: Award availability is hard to find for the St. Regis Maldives Vommuli Resort. Be sure to check the Marriott mobile app when looking for your reward stays, because sometimes it shows more availability than what’s on the website. It’s important to account for the cost of transportation to these remote resorts in the Maldives. This property probably has one of the most expensive seaplane transfer costs, running at $665 per person! But with high costs come high rewards, and the St. Regis Maldives won’t disappoint on service. They provide a butler to help plan your stay with dinners and activities, offer free bike rentals to ride around the island, and also provide free yoga and other group exercise activities daily. You can even rent your own 68-foot private yacht named “Norma” to go island-hopping (or escape the island for an overnight getaway)! The St. Regis Maldives Vommuli Resort will definitely make your dream of the Maldives a reality and provide the most value for your points. Take advantage of the 5th night free and book before 2018 and stay for an average of just 48,000 per night! The Sheraton Maldives Full Moon Resort & Spa would probably be my last choice when looking to redeem my points for an award stay in the Maldives. It is not far from the international airport (only 15 minutes by speedboat), making it a less remote destination compared to other resorts. That does help save on costs, with one of the most inexpensive airport transfer options at just $136. The Sheraton Maldives is a category 7 property — the same award category as the other Marriott properties in the Maldives — and costs 60,000 points per night. It is the only one that will stay a category 7 property in 2019. While redeeming points at this property will still provide tremendous value, it is usually the least expensive when booking regular rates with cash. Therefore, we suggest trying to find availability at the other Marriott properties before committing to this one while they’re all still in the same award category. The W Maldives looks like an incredible private island resort and would make a great redemption using your Marriott Bonvoy points. It is a category 7 property, but will become a new category 8 property in 2019 (just like the St. Regis). Booking your reward nights prior to 2019 will cost only 60,000 points per night, or 48,000 points per night using the 5th-night free benefit. In 2019 the category 8 rates go into effect, and this will cost 70,000 off-peak, 85,000 standard and 100,000 peak per night. The W Maldives offers both seaplane and speedboat transfers — the seaplane costs around $500, and the speedboat costs $350. It’s also possible to book an overwater bungalow on points. This will be at a higher rate than the standard room, but not as high as it used to be. 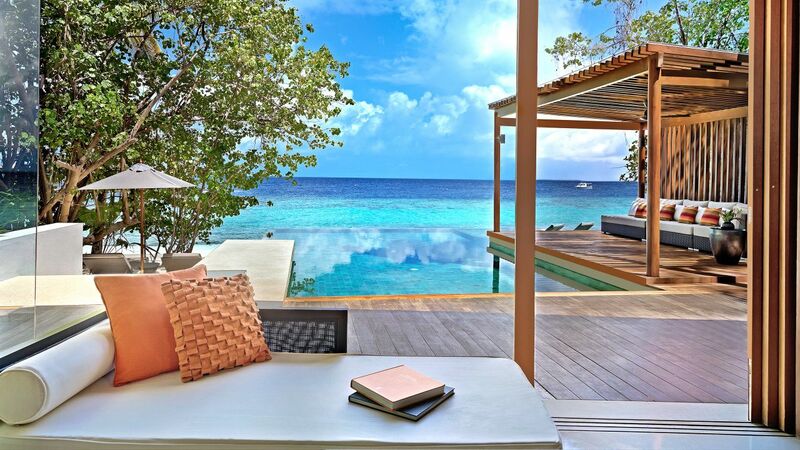 Right now you can book an overwater lagoon-view villa for just 85,000 points per night. The W Maldives does have a house reef, so you can just snorkel right out from your room. It also has plenty of additional activities you can book, like swimming with whale sharks and manta rays, or sunset sail cruises. We recommend you book your stay soon to take advantage of the current category 7 rates of 60,000 Marriott Bonvoy points per night. The W Maldives will not disappoint! We’ve already covered multiple ways to earn lots of Marriott Bonvoy points from our favorite Marriott credit cards. If you’re not transferring your Marriott Bonvoy points to their many airline partners to get you to the Maldives, using your points to cover your stay is another great option! With 2 fantastic properties available (and a third if you’re desperate) plus 2 more set to open, you have plenty of options to use your Marriott Bonvoy points for your stay in the Maldives. We hope that this guide will help you make the trip to the Maldives — one of the most sought-after luxury vacation destinations — for a fraction of the cost by utilizing your points and miles. While the Maldives is a luxury destination, we don’t want you to pay luxury prices! Taking a special trip to the Maldives is the perfect time to start using your hard-earned points and miles to upgrade your travel style. We know availability can be tough to find, but it’s worth spending some time looking into all your options! Persistence is key — sometimes hotels and airlines release reward space sporadically, so it’s always best to keep checking and using different avenues to search for award space. Brandon was born and raised in California and really didn’t travel much growing up, even outside of his own state. While attending college, he was constantly looking to find the cheapest fares to any destination abroad, and quickly learned about the motto- “Chase the fare, not the destination”. Luckily, his first international flight was to Costa Rica (under $300 roundtrip) where that “Pura Vida” lifestyle (and Imperials) hit him hard, and he knew he had to see more. Is there a preferred or bad time of the year to go to the Maldives? Hey Dan, the monsoon season generally lasts from May to October and is the worst around June. We generally avoid going at these times. But at the same time, prices will be way cheaper during these months. November to April is high-season. Thanks for the great extensive & informative piece. I have a question going the other way though: Maldives to JKF (one way) since we’ll be booking a one way from JFK to Southeast Asia to visit family (& will likely pay for a flight from there to Maldives as cash fares are t too bad). Do these flights you mentioned from US to Maldives also operate one way from Maldives to US? We would love to either fly QSuitea or Ethihad from Maldives to JFK. Thanks! Etihad does have a nonstop from Male to Abu Dhabi and then a nonstop from Abu Dhabi to JFK. Unfortunately, only the Abu Dhabi – JFK route is in their most famous A380. Qsuites does not operate to/from the Maldives as of right now. You can look at Cathay Pacific for flights via Hong Kong too. Stephan, thanks for that note! Ah that’s a bummer—no QSuites from Maldives to JFK via Doha (but if I still book Qatar from Male to JFK, will they Doha to JFK connection be at least QSuites?). Cathay Pacific may not work as we’ll be visiting Malaysia and not sure how we’ll fit KL-HKG-MLE-JFK into a pts redemption. Thanks for your insight! Your DOH-JFK flight will be in QSuites. Just be sure that it’s on flight 701 or 702. There’s 2 daily flights and only one of the has QSuites! If you’re visiting Malaysia and want to fly Qatar Airways QSuites, consider using Cathay Pacific Asia Miles to construct a oneworld multi-carrier flight. This will allow you to try flights on Malaysia Airlines, Cathay Pacific, and Qatar Airways! The redemption prices are very reasonable too considering the amount of value you’re getting. Stephen, so if I want to do a one way Etihad in business class from MLE–AUH–JFK, do I search for it segment by segment or can I search it MLE–AUH–JFK on Etihad’s website? Also, is the 70k AA miles for this whole route? Thanks! You can search the whole route together. It’s 40k AA each way in economy and 70k each way in business. Hope this helps! Thanks for the clarification Stephen! Thank you for this helpful post. I see a mixed cabin award from JFK to Dubai to Maldives. JFK to Dubai is in j, but Dubai to Male is in coach. Do you know if j seats open for the Dubai to Male segment, if I can call Alaska to change my seats? Will I need to pay anything to do this? Where do you suggest I search? I’ve been looking on Emirates, Qantas and Alaska. Do you also know if I end up keeping the coach seats, if I will be able to use the business class lounge in Dubai since I already paid for it? Or I probably won’t since my boarding pass will show I am in coach. Thank you! It is difficult to predict when award availability will be released. You won’t be able to use the business class lounge unless it is just a layover. You can use Alaska to check award availability. What we generally suggest is performing the same search once a day and then if/when award availability pops up for the DXB-MLE leg, immediately call Alaska. I have a question about booking the W Maldives with points. The article mentioned an overwater villa is 85k a night, where did you find that information? I looked on the W Maldives page and the only room that can be booked with points is the beachfront villa. I even called the Marriott customer service number and they can’t see any award availability for the overwater villa. Can you tell me a way to book that with points? Thanks! Overwater villas in places like the Maldives and Bora Bora are wishy-washy. It’s very rare that you can find overwater villas at the same price as regular rooms, but one example is the Conrad Maldives, which for specific dates, can actually be found for the same 95,000 Hilton points as the “regular” villas. The availability is very sporadic and may not always exist. Promotions can randomly pop up that enable these rooms to be booked. Air Canada Aeroplan: What Region Is Your Destination?